Damaged and cull Silver Dollars are great way to amass silver dollars at the lowest premium. 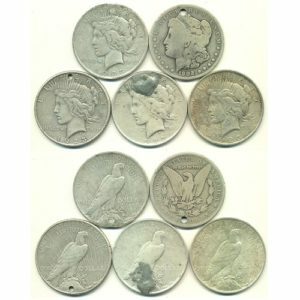 Cull dollars are silver dollars with no extra numismatic value – which means more silver for your money. Culls can be scratched, discolored, painted, cleaned, have glue residue etc. 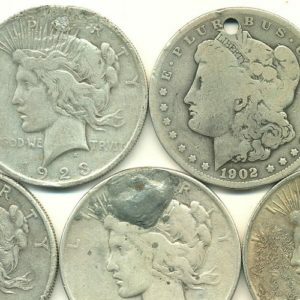 Damaged dollars are “lower than cull”, Morgan and/or Peace Dollars that may have holes, gouges, solder, corrosion or other forms of damage that remove any potential numismatic (collector’s) value. 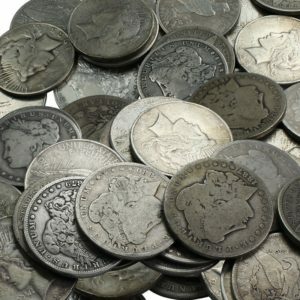 Crappy coins = more silver for your money! Cull and damaged dollars will be our choice of Morgan and/or Peace Dollars.